Over 18,000 citizens of the Central African Republic (CAR) have fled renewed fighting in their homeland to take refuge in neighboring Chad in recent weeks, according to United Nations officials. The violence and subsequent spike in the flow of Central African refugees into Chad has added new pressure to a major displacement crisis that has grown in the region since communal tensions erupted into armed conflict there in late 2013. At a Feb. 2nd briefing in Chad’s capital of N’Djamena, United Nations High Commissioner for Refugees representative Mbili Ambaoumba said that the UNHCR had completed initial registration procedures for 18,256 refugees from CAR since the end of December. That number is greater than crossed into Chad during all of 2017. Local villages and sites for new refugee encampments have already been identified to house the newcomers, with one new tent community only 200 yards from the frontier. 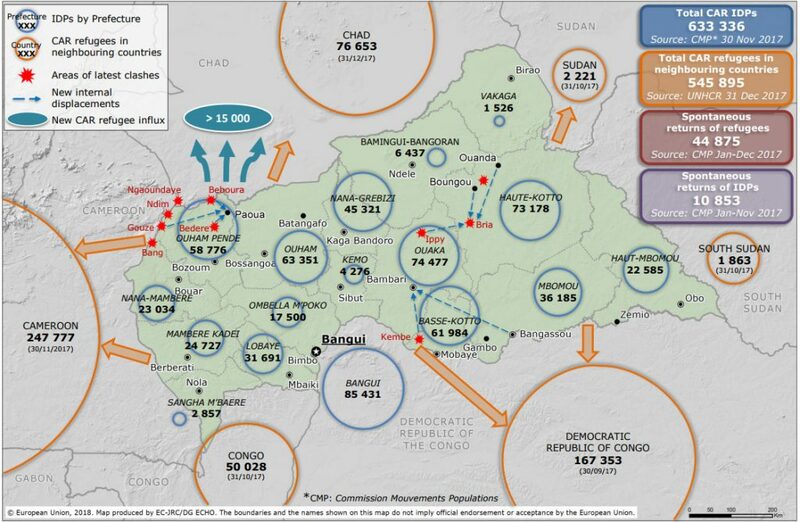 This map, produced by the European Commission’s Humanitarian Office, ECHO. Shows the location of CAR refugees in surrounding countries as of late 2017. Since late 2013, more than one-half million CAR citizens have left their homeland because of violence and now reside in neighboring countries, including Chad, Democratic Republic of Congo and South Sudan. Near 700,000 others are displaced internally within their own country. With CAR’s total population listed at just under 4.6 million, the latest increase in refugees means that more than a quarter of the country’s population has been displaced by armed conflict. International Medical Corps has provided humanitarian assistance in both Chad and CAR for several years, including emergency medical care, surgeries for victims of conflict, screening and treatment for acute malnutrition and protection for children and survivors of gender-based violence (GBV).